Electing for a quality carpet installation makes all the difference in the longevity and protection of your carpet. Carpeting can be installed in a number of different ways, each bringing an additional design element into a living area. It’s important to select a professional installer to help you achieve your vision of the perfect flooring to match your home or business décor. The correct installation method depends on the product you select. Issues such as seaming requirements, maintenance conditions, pattern matching, and the type and intensity of traffic all need to be thoroughly considered before beginning the installation. If you are not extremely knowledgeable in all of these areas, installing carpeting yourself could be a costly mistake. 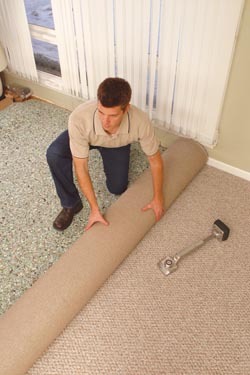 There is more than goes into properly laying down carpet than the actual process itself. Selecting the right carpet that is functional, attractive, and appropriate for the location is essential to being ultimately satisfied with your carpeting choice. Unless you’re a professional interior designer, chances are you’re not exactly sure what style, color, and texture carpet you should choose for each room in your home or place of work. And, if you’re an interior designer, chances are you aren’t well versed in the proper techniques and tricks of professional carpet installers. Come to one place—our company—and experience the expertise from interior designers and flooring installation technicians to guarantee a superior end product. Carpet installations involve a lot more work than one might think. That’s why investing in a professional is always worth the cost. First, one must correctly measure the floors and determine how much carpet is needed to purchase. Next it is necessary to determine the carpet layout in the room, decide where to place seams, and how to match patterns, as well as how to minimize carpet waste and trips back to the carpeting store.